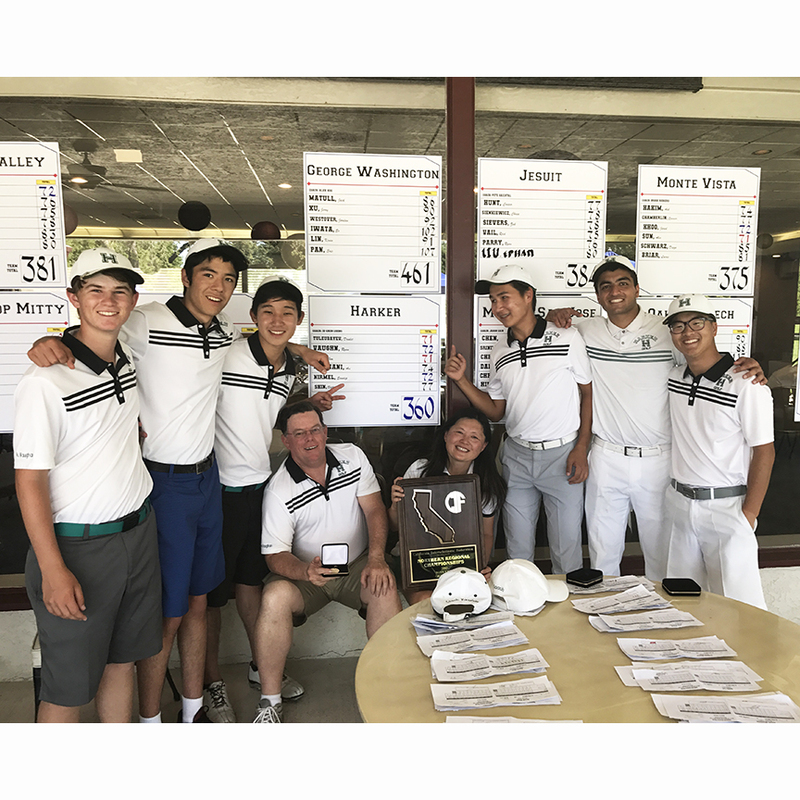 The Harker boys golf team took the Northern California Championship yesterday, driving its way into the Harker record books as the first boys varsity team to win a championship since Harker opened its high school in 1998. Congrats to Daulet Tuleubayev, grade 11; Ryan Vaughan, grade 12; Sandip Nirmel, grade 12; Victor Shin, grade 11; Jin Kim, grade 11; Avi Khemani, grade 12; and coaches Ie-Chen Cheng and Tom Vaughan! Cheng was thrilled by the boys’ performance but saw the team’s potential early on. “To be honest, I felt very confident entering this postseason,” Cheng said. “In the beginning of the season, I challenged the team to shoot even par as a team for every one of our matches and tournaments. I told them if we can do this, we can win NorCals. That was our goal – win the NorCal Championship – and that is exactly what happened. We struggled throughout the season to put together a round where each shot their best. “The team started the season well, winning their first tournament at Lone Tree” and followed with some decent scores, Cheng continued, “but we certainly weren’t playing our collective best. Our first sign of impending success was against Menlo at their home course. They played their best, and we went 2-under as a team; that put a lot of life back into the team,” she said. Cheng looked at the postseason as five stages. “We won the first stage by winning our league tournament,” she said. “Then, we went on to win the CCS Regionals, a first for us. Then we came in second for the second straight year at the CCS Championships. The fourth phase was winning NorCals. “We were 2-over as a team at the turn. We had a long wait to start the back nine, and I was concerned it would ruin our rhythm,” she continued. “But we made sure the boys stayed loose, refueled to prepare for a very hot afternoon and back nine. They responded. I know we were the most prepared team. So yes, I had a quiet confidence we could pull this out. However, I think most teams there were surprised we played this well. The boys were absolutely phenomenal yesterday on the biggest stage. “And now this is the final step for us, State Championships. Historically, Southern California has dominated the golf championships, but we’re going to give it our best shot,” Cheng stated. Naturally, the boys were excited. “I realized we had a good chance to win when I came in with a good score and heard from the coaches that my teammates were playing well,” said Nirmel. “I have a ton of confidence in my teammates, because they always play hard and are strong competitors. However, in golf, you never really know who will be the winner until all the players have completed their rounds, and so we all cheered on our teammates as they came in on the final hole; after all, every shot counts!